PSD2 is a HOT topic at the moment, and will continue to dominate discussions for the foreseeable future. The revised European Payment Services Directive (PSD2) is multifaceted regulation with implications for banks, technology companies, financial institutions, regulators and most important of all, You and I – the end customers. At first glance, the PSD2 focus seems entirely on retail but there are some things that corporates need to know too! Keep in mind that PSD2 – the revised Payment Services Directive – came into effect on 13-Jan-2018. How will PSD2 and Open Banking Affect Corporates? You can read more about the difference between BEN, OUR and SHA to understand how these values are used today to determine who will bear the payment charges. Most of the below unless otherwise stated will come into effect from September 2019 as part of the PSD2 RTS – Regulatory Technical Standards. It is clear to see that the banks are worried because Fintech’s see the massive potential to disrupt banking. Fintech companies through their customer focused solutions utilise new technology, and they have an innovative outlook on longstanding problems in various areas across the financial services landscape. Many new players in financial services are focusing on specific customer pain-points and are not hampered by legacy systems, that are stifling many incumbent financial institutions. This is revolutionary because it literally opens up banking to non-bank participants! This gets to the heart of the PSD2 objective around promoting innovation and competition in financial services, and will allow new players (the Fintech’s) to sit between the traditional relationship between the bank and their corporate customers. Where access is granted by the customer or corporate, PISPs have the ability to make a payment from their customers bank account. 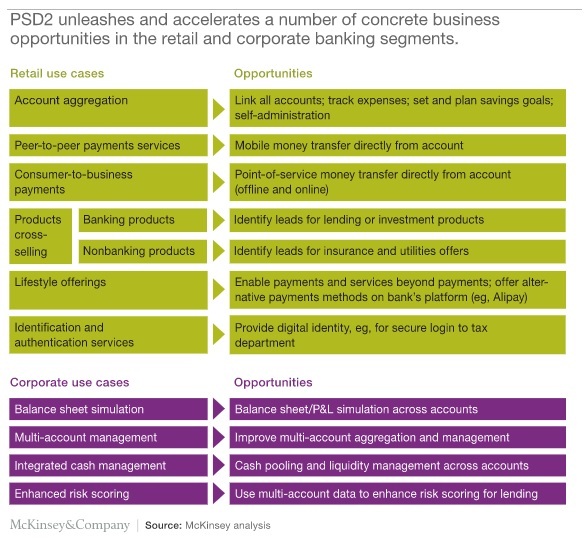 With PSD2 the European Union is facilitating Payment Service Providers (PSPs) to offer new solutions and where access is granted offer non-bank entities “open access” to traditional banking operations. This is second part of the “Open Banking” revolution, where non-bank entities will have the ability to access and aggregate balance and transactional account information from many banks into a single portal. In the past corporates have worked with multiple banks to provide a bank statement (BAI2, MT940, CAMT.053) and manage any bank specific limitations. Now, with AISP’s you would like to think that the bank limitations are removed and you have an AISP partner that can deliver account statement in a timely, multiple formats and secure manner. As above, Fintech providers will sit between the bank and corporate and have the ability to provide value added solutions to their customers. For further information, take a read of WTF does PSD2 say about 2FA? These rules come into effect from 13th July, 2018. In the past payment service providers (PSPs) were obligated to respond to payment complaints within 8 weeks. This has now been drastically reduced to just 15 business days, and in exceptional cases to 35 business days. See further information provided by PwC on PSD2 Rules on Complaint Handling. You can see why the banks are getting worried…! Pingback: Happy Birthday Open Banking, Happy Birthday To You! !